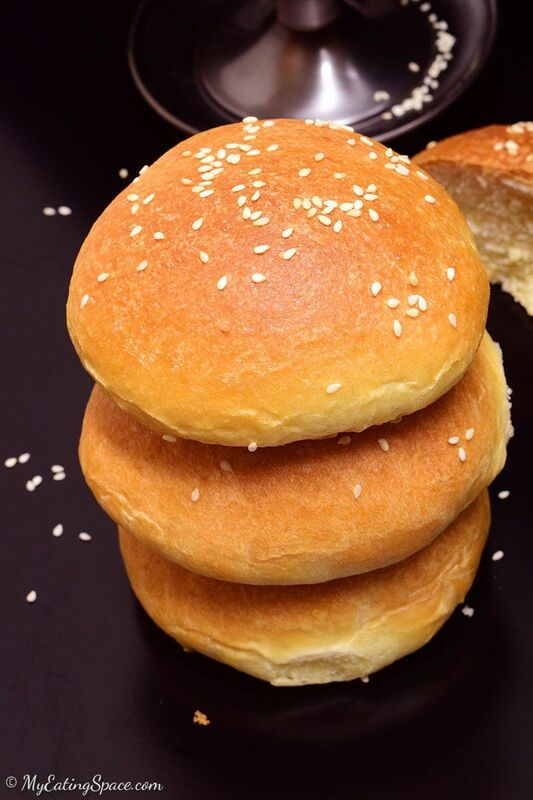 What about making some burger bun in the comfort of your kitchen? Today we are going to make buns, that too homemade – means we know what all ingredients go into the recipe. 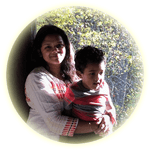 Since we don’t use any preservatives, the shelf life will be less compared to the store ones. But they taste great. Our homemade buns don’t even last for more than a day. Since I mentioned burger bun, the first thing that comes to your mind will be a hamburger, right? In my case, buns make me think of the sick fever days and the hospital days. I know it’s a little strange but that’s how it is. It’s not that i hate buns. I want only buns and breads on those days. They are the only food that keeps me alive on sick days. When I had my luck in making breads at home, i was happy. [ recipe of homemade bread here.] But when I made soft and fluffy buns, I was super excited. Enough talking, lets go to the recipe. Baking bun and bread in the comfort of our own kitchen is a wonderful feeling. 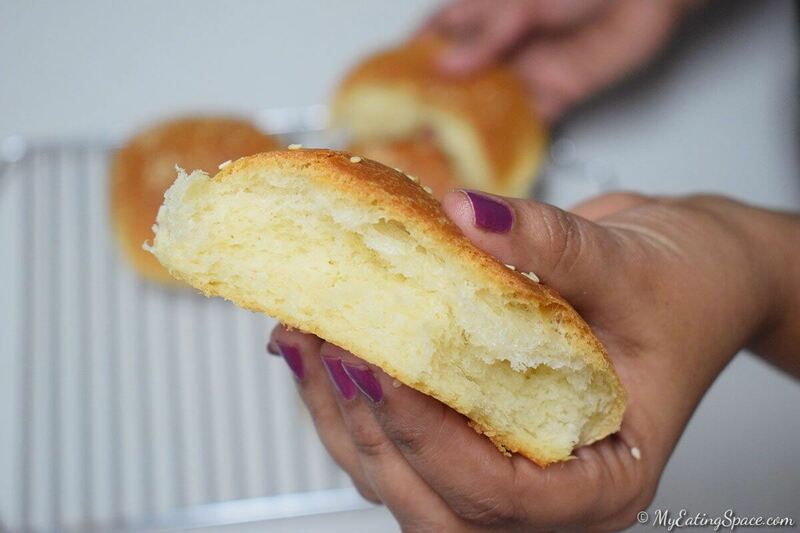 The whole house smells like a bakery.Try this out. Mix the yeast, ½ tbsp sugar and milk in a large bowl. Keep aside undisturbed for 10-15 minutes or until bubbles start to appear. This is yeast proofing. Now add remaining sugar, butter, flour and salt to the bowl. Nix well with a spoon until combined. Knead the dough until smooth and non-sticky. Cover the bowl and let the dough rise and double in size. This may take some 3-4 hours. After the dough had doubled in size, punch it down and knead again for 5 minutes. Divide the dough into small 8-10 balls. Make them into round balls by gently pressing the dough with both hands, pulling the sides to the bottom and tucking the ends underneath. Watch video of homemade bread here for this step. Place them in a cookie pan, a few inches apart. Let it rise again for 30 minutes. Preheat the oven to 400 degree Fahrenheit (200 degree Celsius). Mix 1 tbsp butter in 1 tbsp milk in a small bowl. Heat until the butter melts. Using a basting brush, spread this butter mixture very gently on top of the risen dough balls. Do not apply any pressure on the dough. Sprinkle some white sesame seeds on top of the dough balls. Remove from the oven. Transfer to a wire rack and cool. 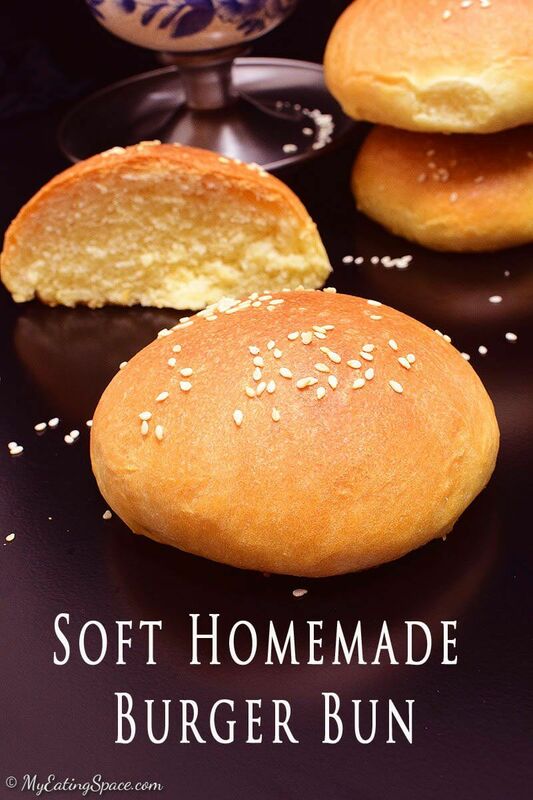 Enjoy the soft homemade burger buns as it is or use them to make your own burger. 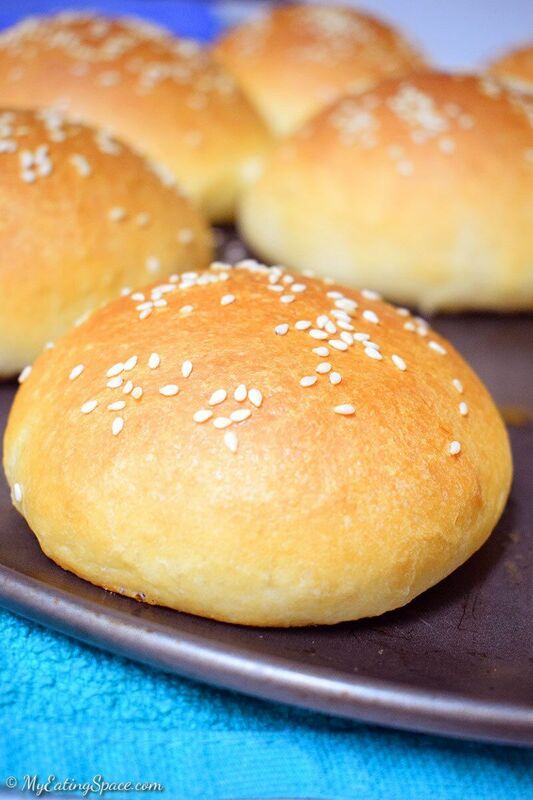 These soft and fluffy burger buns are definitely worth a try.